As part of National Apprenticeship Week, SFA Digital apprentices, a former apprentice and an apprentice manager will be blogging about their experiences. Today, we hear from Luke, a Software Development Apprentice who joined the team in September last year. I’ve been interested in IT since I was about 10 because my dad works in the industry. I started studying computer science at A Level and really enjoyed it. I liked the coding side of it a lot more than the hardware side, as I liked the idea of being able to create applications which I could use myself or share with other people. 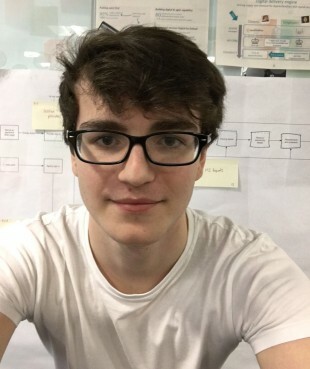 I decided to take my interest further by doing an apprenticeship in software development. After researching what most companies looked for when hiring a software developer, I realised that not many asked for a degree - they wanted people with experience in the workplace. I decided to take on an apprenticeship because it gave me the opportunity to get experience as a software developer. I also believe it is a much quicker path to becoming a good developer because you are able to get the experience straightaway, without having to spend three years at university first. After two or three months at the SFA, Jordan and I were put onto a project which needed to go live at a specific time. I hadn’t expected to be working on a real project so early, but I’m glad I got the opportunity. It was a great experience and helped me understand what is expected from a developer, and I like to get my hands dirty as soon as possible. We are currently working with an agile tester and creating a suite of common tests which will be used throughout the SFA. We have also worked on the Pledge-o-meter which has recently been released into live for National Apprenticeship Week. When you are on a project which is going to be used by a wide range of people it gives you the determination to get it done to the best of your ability. I have always loved doing something which matters and this is the way I like to learn and progress in my job. During our apprenticeship, we are rotating around the Agency to see what all areas of the business are like. This gives me the opportunity to see what I like best and gives me an insight into all the other job roles which are available. So far I have got an understanding of how development, project management and testing work in the agency and I look forward to moving to the other areas. I now have a better understanding of how many different roles are needed for just one project, big or small. I use to think that the developers were told what to make, then they made it, and then it went live. My parents were wrong - work isn’t harder than school! When I was younger I can remember my Mum and Dad telling me how much harder work was compared to school, but I disagree. It depends where you work and what you do in your job. I find working a lot more enjoyable then school and this allows me to learn even more so I can specialise in what I want to do when I’m older. The apprenticeship has made me much more independent and developed my personal skills. I now know what it is really like to be in a working environment and it isn’t as scary as everyone says. My apprenticeship - what happened next?